Active on 6m since 1989. QRV on 6m EME since 1997. As you will notice, my main interest is 6m, 4m & 2m (50mhz, 70Mhz & 144mhz). 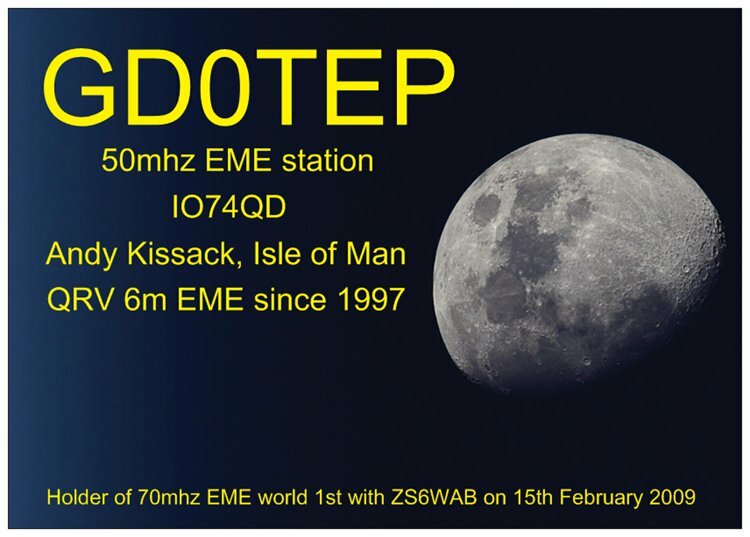 · A WORLD FIRST ON 70MHZ! · Weak signal EME using JT65 and CW modes 6m, 4m and 70cm. Updated October 2017. · My Linear Amp UK GS35b 6m amplifier and modifications to cure design faults on it. Including TIP147 failures. · Prosistel PST61 rotator failure, and welding repairs. · The GI7b Triode - Specifications. · Moon set limitations, looking west. · Map of the World, squares worked (6m - 50mhz) last updated January 2016. · Map of the World, squares worked (4m - 70mhz) last updated January 2016. · The Northern Lights Contest Group, MD6V, MD4K, etc. · Scatter on 50mhz - Audio file of DF9OX, have a listen. Conversion: Units of U to Inch.